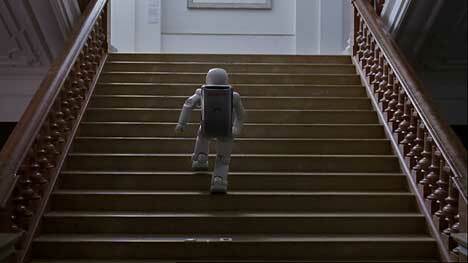 Honda is promoting ‘warm technology’ in a campaign featuring Asimo, the humanoid robot, wandering through five Berlin museums, including Museum für Naturkunde, German Museum of Technology in Berlin (Deutsches Technikmuseum). 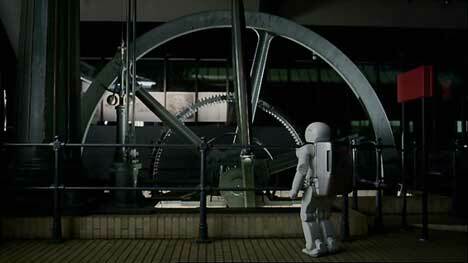 In the 90 second TV advert released in the UK this month, Asimo walks past a ship’s propellor in the Nautical Department of the German Museum of Technology, stops to inspect a large cog wheel, and climbs stairs to the Aerospace exhibition. He stops long enough to experience a drop of water falling on his face, catches himself on a surveillance camera’s display screen. 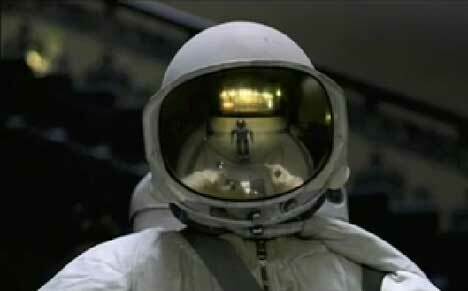 There’s a moment of recognition as Asimo meets up with an astronaut suit. Asimo concludes the museum visit with a walk through the top layer of the Aerospace Department, perhaps fantasizing about one day being able to fly himself. The Honda Asimo Museum TV ad was supplemented by five short teasers directed by Henry Mason and webcast at www.honda.co.uk/asimo, outdoor mega sites and large posters showing the profression of Honda’s 20 year robot programme. The ‘warm technology’ campaign will continue with the inclusion of the new model CR-V car with its adaptive front lighting, collision mitigation braking, and rear parking cameras displayed in the satellite navigation system. New advertisements will highlight the FCX hydrogen fuel cell car, new HondaJet plane and CR-V as examples of Honda’s approach to alternative technology. 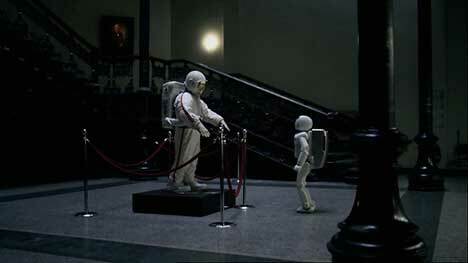 The Honda Asimo campaign was developed at Wieden+Kennedy, London, by creative directors Tony Davidson and Kim Papworth, creatives Chris Groom, Stuart Harkness and Michael Russoff and agency producer Julia Methold. Filming was shot by director Peter Thwaites via Gorgeous Enterprises, London, with producer Alicia Bernard and director of photography Stuart Graham. Post production was provided by Flame/VFX artist David Smith and producer Sally Heath at Absolute Post, London. Offline editing was done by Neil Smith at Work Post. Grading was done at The Mill, London. Location service was provided by the team at Trigger Happy Productions, Germany. Sound was engineered by Jack Sedgwick at Wave Studios, London. Music was accessed by Musicstylist Jesper Gadeberg, via Mark Kirby at Form Music. Music for the Honda Asimo Museum spot, “Ba”, was composed by Goldmund (Boston-based Keith Kenniff aka Helios and Unseen Music) and is available on his album, Corduroy Road. Honda’s robot project began in 1986 when a team of engineers received funding to work on a machine that could walk like a human. The first incarnations were little more than computers on awkward mechanical legs but 20 years later, ASIMO is capable of running at a speed of 6km/hour, which means momentarily having both feet off the floor, an incredibly difficult engineering accomplishment. It also features the ability to perform tasks in a real-life environment for example walking hand-in-hand with a person and carrying objects using a trolley or cart and can recognise moving objects, posture, environment, sounds and faces. The team is now working on the next challenge – introducing brain-like intelligence.